In today’s culture we think of “entertaining” as hospitality. Karen Maines has pointed out that entertainment and hospitality are two different kinds of events. Writing in Moody magazine, she observes four important contrasts. First, entertaining says, “I want to impress you with my home, my clever decorating, my gourmet cooking.” Hospitality, seeking to minister, says, “This home is a gift from my Master. I use it as He desires.…” Hospitality aims to serve. Second, entertainment subtly declares, “This home is mine, an expression of my personality. Look, please, and admire.” Hospitality whispers, “What is mine is yours.” Third, entertaining looks for a payment—the words, “My, isn’t she a remarkable hostess.…” With no thought of reward, hospitality takes pleasure in giving, doing, loving and serving. Finally, the model for entertaining is the slick women’s magazines with their alluring pictures of foods and rooms. 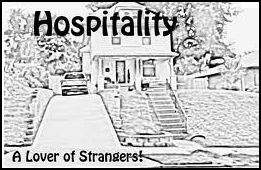 The model for hospitality is the Word of God. Christ sanctifies our simple fare and makes it holy, useful. In our fast food culture where time is our scarcest resource, it’s difficult to sacrifice it to be hospitable to the stranger. Hospitality takes time! We visited a small country Church about 80 miles east of Dallas with only about 25 people in attendance. We were invited to dinner by just about every one of them. They did it with such enthusiasm that we’ve never forgotten it. That was leadership by example!